Claire Wilson from Alsager is set to swim across the English Channel in August to raise money for The Christies. Claire is an experienced open water swimmer and used to be a member of Alsager Swimming Club where she was coached by Eric Hawkins. She has been swimming a minimum of 20 kilometers a week since Christmas with as much as 60 kilometers (2400 of a 25m pool) some weeks as part of her training for the grueling ordeal. 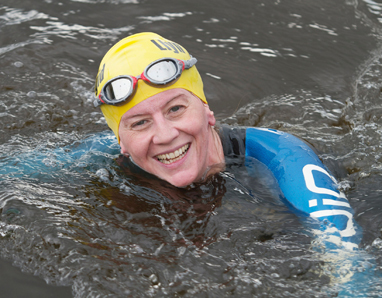 Claire will make the attempt the week commencing 8th August, weather permitting, to swim the 21 miles (36 kilometers). Under channel swimming rules Claire will be allowed to only wear a swimming costume – wetsuits are not allowed – goggles and swim cap. She will be supported by her husband and coach aboard a pilot boat with an official observer from the Channel Swimming Association who will make sure Claire follows the rules – and doesn’t touch the boat. Claire is taking on the mammoth challenge, it could take up to 14 hours and may be overnight, to raise money for The Christies who have been looking after her father who has skin cancer. To sponsor Claire and help raise money for Christies go to justgiving.com and search Dilys Birchenough.